At 07h30 all participants get together in Swakopmund. Once assembled, radios will be handed out and installed in all vehicles before we take the road north. The opportunity to fill up on petrol/diesel will be done at Terrace Bay. During this day we will mainly travel (if not the whole day) on main roads (non – 4×4). Our last refuelling point will be at Terrance bay approx. 340km North of Swakopmund. For our first night, camp will be set up in the vicinity of Mowe Bay. We travel from Mowe Bay passing the Hoarusib River, the Graves of the Seamen (Sir Charles Elliot passing the Khumib River through the Sarusas Valleys to Cape Fria. We will camp in the vicinity of Cape Fria. 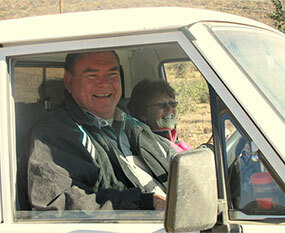 We will travel from Cape Fria to the Kunene River Mouth, where we will reach the most North-Western border of Namibia. From the Kunene River Mouth we will backtrack 12km to Bosluis Bay where we will set up camp for the evening. From Bosluis Bay we cross the 45km dunes in an Easterly direction towards Hartmann’s Valley in Kaokoland. Tonight camp is set up in the heart of the Hartmann’s Valley. We travel from the campsite in the Hartmann’s Valley to Orupembe, where we will take on water for the remainder of our journey. From Orupembe we travel to the Khumib River vicinity where we will pitch camp in the surrounding mountains for the night. From the mountain campsite we travel in the Huarusib River via Puros to Sesfontein where there will be another refuelling opportunity. After refuelling we drive 35km towards Khowarib (on the banks of the Hoanib River) where we will set up camp for the last time. After coffee and breakfast we say good bye and we part ways for the last time. The road back is open and in a good condition and you should have no problems finding way back home or to any other destination. Dekker Smit (photo) is one of the most learned and knowledgeable people on the Namib Desert and an unlimited source of information on the Namib in particular and Namibia in general. Your tour leader is an experienced adventure guide. He will be in radio contact with you at all times and impart a wealth of biological, cultural, historic and four-wheel drive knowledge. R13900 per person, including pre and post tour accommodation. Excluding vehicle cost. Vehicle starts at R800 per day excluding insurance, insurance starts from R130 per day. The above are proposed dates which can be adjusted on request. There are two different routes on the Swakopmund - Kunene river mouth - Kaokoland tours one including 45 km dune driving and the other one without the dune driving which will only be over 6 days. With more than 15 adults guests can request their own specific dates.